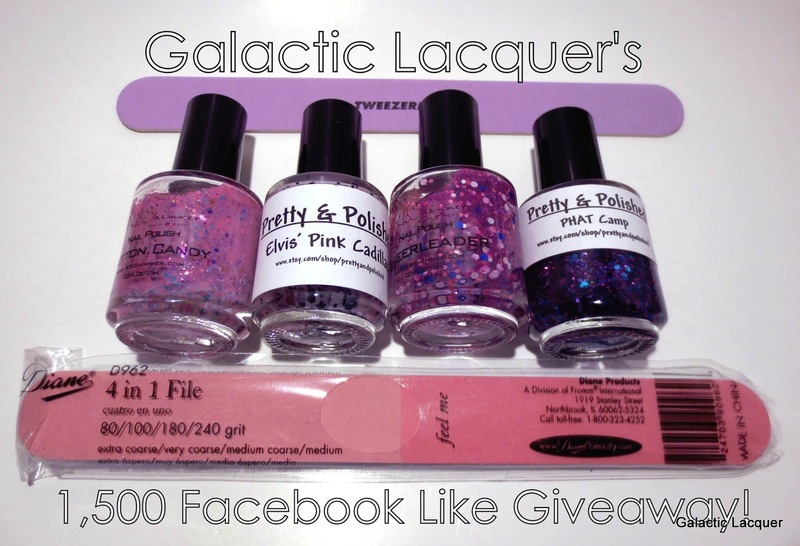 Galactic Lacquer: 1,500 Facebook Like Giveaway! It's that time again - giveaway time! It's a very exciting time for both me and you. I'm so happy to have reached 1,500 fans on Facebook. I thank you all for your continued support and interest in my blog and my passion! So I want to have some fun and reward a couple lucky fans! I have two great prizes up for grabs via Rafflecopter (widget below). Since it's February, I decided to go with pinks and purples for Valentine's Day. But the polishes are pretty on their own if you're not into that too! Winners will be contacted via email, and have 48 hours to respond before I choose new winners. Please use an email address you check frequently! This giveaway is not sponsored, endorsed, or in any way associated with Facebook. It is a blog giveaway for fun. All prizes were purchased with my own funds. This is not a sponsored giveaway. I am also paying for shipping with my own funds. So if something is lost or broken in transit, I am not responsible for replacing it, sorry! I will pack everything very carefully and give the winners tracking numbers though. Winners will be chosen randomly via the Rafflecopter widget below. The first winner will get their choice of prize, and the second winner will get the remaining prize. Thank you for the giveaway! The purple!!! Because it's purple and it glitters and I have to have anything that is purple and glitters!!! I'd prefer the "Pink Prize"..mainly because it contains Elvis' Pink Cadillac (my aunt LOOOOVES Elvis, and I would love to do her nails with that polish). They are also gorgeous!! Thank you for the giveaway!! I really like both prizes, I'd probably lean towards the Purple pack though. :) Thanks for this giveaway and grats on the milestone! The Pink one because those 2 polishes are ones that I have been wanting. Thanks for the giveaway. I've followed you on fb for a bit now, don't know why I hadn't followed your blog till now. I guess the pink one but I love both of them really! Thanks so much!! I would prefer the purple pack because the colors are stunning! Purple please! They're both lovely though. Ach the purple pack! Phat camp is GORG. I really really LOVE the purple set, but honestly I would take either. What a wonderful giveaway!! purple polish!! phat camp is phabulous!! I like the purple prize! I wear purple more than pink. Pink prize ... love pink and elvis. I would be happy with any prize!!! There is too much love to chooses from!!! I'm not fond of cream based glitters, and I loove purple. Therefore my choice would be the second but that is not to say that I wouldn't use the pinks and maybe fall in love those cream based formulas! I'd love either!! They're all gorgeous polishes,though, if I HAD to choose I'd go for the purple! i love the Purple Prize! Purple prize! I love that KBS polish!!! The purple one looks awesome! Purple prize would be nice. I think I have those pinks, so I'll go for purple! Congratulations on your FB milestone!! I really like both, but surprisingly, I think I like the purple one more. That's a hard choice! They both have a polish from my two favorite indies, and I've turned into a total hoarder of both pink and purple polishes, but I guess I will have to go with purple, since I have slightly more pink polishes (currently!). Purple prize! I just love the colors in those polishes. They're both great though! Oooh purple prize please! Thanks so much! Pink pink pink! Thank you! Pink, because I really love the pink with black glitter! I love the purple prize! But oh my gosh, the pink prize is so fabulous too! I really can't choose. They both are super pretty. I would love either of them! I love KB Shimmer's and I don't have that many! Cotton Candy. It looks fun! OOOO such a hard choice! I think I prefer the purples but how do I pass up anything with Elvis in it! I love them both, but if I had to choose, I'd say the purples. Thanks for the awesome giveaway!! I would love the pink prize as I don't have either of those colors yet! Thank you! I like both prizes but I like Cheerleader and PHAT Camp best. I'd love to win it because my daughters and I share a love of nail polish and these polishes would be awesome for one of them! I like the purple but love them both! I love the pink set! I love the purple set. I would like the pink mostly because it's close to Valentines Day!! I'd love the purple prize as purple as always been my favourite color!! Purple! It's my favorite color! My purple obsession is telling me that I want the purple prize pack lol. Pink Prize cause those polishes are just DARLING! Plus I am in dier need of a nail file! Thanks for the chance! Pink prize!!! I have been wanting the Elvis one for a while now! The purple prize, it's my favorite color! The purple because I'm not a huge fan of pink. I would love to win the Pink Prize!!! Sending lots of love from RAoP!! I love the purple! I'm more of a purple girl than a pink girl! The pink caught my eye :) I don't own any indies yet and these look amazing! I would really, really love to play around with the purple set! :D I have no indies yet, and these look so amazing! A hard decision, but I think the pink one! I definitely prefer the pink! Thank you for the giveaway !! I want the P!NK Pr!ze !!! BAD.. I love everything P!NK !! If I won, I would want the purple prize!! Purple is my all time favourite colour and I am dying over how gorgeous "phat camp" is! I would love the pink prize - thanks for the giveaway! Pink is my favorite, and I've been drooling over both of those polishes for a while now! I love them both but perhaps the pink one slightly more! The pink prize for sure. The Elvis one looks amazing and beside you can never go wrong with pink and black! The pink prize!!! Thank you for the giveaway!!! The first one because I have cheerleader already. Most definitely the purple since it's my favorite color. Thank you for the opportunity. Congrats on 1500! The Pink prize! :D Great giveaway! Thanks for the chance! Thanks so much for the great giveaway! 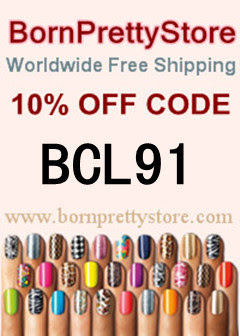 I'd love to get an indie polish!